Meet Kelly Leage, Columbia’s State Park Interpreter since last July. That title is the fancy way of saying Special Event and Volunteer Coordinator. Kelly lived most of her life in San Luis Obispo County. There, she raised five children and for 17 years took one evening class each semester at a junior college. After graduating from Cal Poly in 2012, Kelly worked at Lake Tahoe as a park aid and later at an environmental science camp on the California coast. All of my life I have wondered where it was that my parents brought us to pan for gold in the high Sierras. I applied for this job and came for the interview four weeks after my father died. June 2 was his birthday, and I came here for the interview, and I looked down the hill at the mining shack here, and on his birthday, four weeks after he died, I realized this was the park he had brought me to as a little girl. I felt like that was a really special gift to receive on his birthday this last year. A woman was baking biscuits outside one day. One of the miners was walking by and smelled her biscuits, and he said something like, “I would give you a dollar for one biscuit, they smell so good.” She just looked at him and didn’t reply. The miner thought that he had insulted her with only offering a dollar, so he upped it to three dollars. Then he paid three dollars for that biscuit. Some exaggerators, or maybe it’s the truth, said that he actually went up to ten dollars for one biscuit. So, she started a biscuit business and made more money than her husband did as a gold miner. 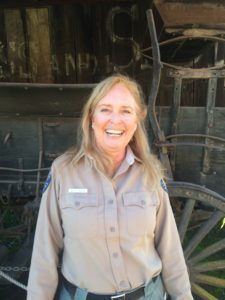 Kelly recommends coming on a Gold Rush Day (the second Saturday of every month from 1 to 4 p.m.) to see buildings that aren’t normally open and interact with docents in period costume. Make sure you try your hand at panning for gold, then get a lunch to go from one of Columbia’s eateries and have an outdoor picnic at one of our many picnic tables or even on one of the boulders you’ll find around the park.